I am not going to write much today, simply because I would rather you invest the next several minutes watching the linked video. 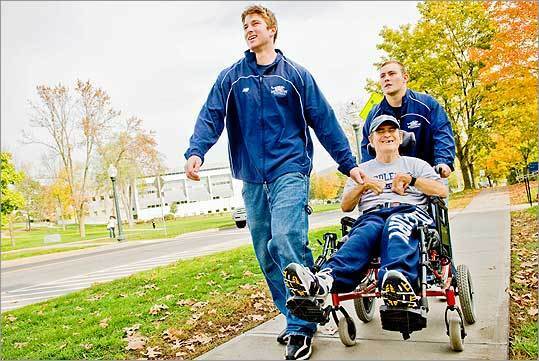 It is a very moving and inspiring story about Butch Varno and the athletes at Middlebury College in Vermont who have been “picking up Butch” for 50 years (!!!) to attend athletic events at the school. Any more commentary from me would just detract from the beauty and power of the story. For some reason I couldn’t get the video embedded, so just click the “Picking Up Butch” link below. It will take two mouse clicks and you will have to endure a 15-second commercial on ESPN’s website prior to seeing the video. Hey Tim! Awesome story. Thanks for sharing. I really enjoy reading your blog. I sent Ms. Kim a link to a video on facebook that you might enjoy seeing. A man at the congregation we attended in Montgomery has a similar situation as Butch; it is about his quest to complete a race! Thanks so much, Hilary! Great to hear from you, and thanks for sending that to Kim. I look forward to seeing it. Hope you guys are well also, and that you, Justin, and your precious little daughter have a wonderful Christmas.